2015 E-Tropolis Retro Lithium. Picture credits - E-Tropolis. Submit more pictures. 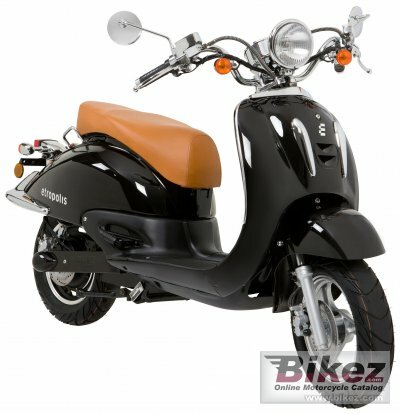 The best-selling electric scooter in Italy since 2011! Somewhat vintage smooth lines, chromed components and a wide range of colors, are the must features of a modern vehicle, equipped with an efficient removable lithium battery with integrated BMS. Price as new (MSRP): Euro 3495. Prices depend on country, taxes, accessories, etc. Comments: Range 70km. Lithium polymer battery, 60V 36 Ah. Charging time 6-8 h. Climbing capacity up to 20%. German brand also written Etropolis. Ask questions Join the 15 E-Tropolis Retro Lithium discussion group or the general E-Tropolis discussion group. Bikez.com has a discussion group for every motorcycle. Here you may find answers to common questions about the model. If you do not find what you are looking for, you can ask questions. Try out the 2015 E-Tropolis Retro Lithium discussion forum. You can sign up for e-mail notifications when other users answer you. If you have information about any technical issue related to this motorcycle, please leave a comment for other riders.